Jedes Jahr im Juli findet unter dem Motto „Get the Spirit!“ der Workshop für ambitionierte Reiter und Ausbilder aus aller Welt in englischer Sprache statt. Vom 22.-27. Juli wird das Ausbildungskonzept der klassischen Dressur vom Einreiten bis hin zur Hohen Schule ausführlich in Theorie und Praxis erläutert. Und jedes Jahr setzen Anja Beran und ihr Team andere Schwerpunkte und Themen. Auf Fragen aus dem Publikum wird individuell eingegangen und auch der Austausch unter den Teilnehmern aus bis zu 20 verschiedenen Nationen ist ausgesprochen interessant. Der Workshop beginnt am Montag um 10.00 Uhr und endet am Samstag um 18.00 Uhr. Die einzelnen Tage gliedern sich immer in ein Vormittagsprogramm von 10.00 Uhr bis 13.00 Uhr, dann folgt eine zweistündige Mittagspause, in der ein dreigängiges Menü angeboten wird (kann gegen Aufpreis dazu gebucht werden) und von 15.00 Uhr bis 18.00 Uhr schließt sich das Nachmittagsprogramm an. Sie erleben je nach Themenschwerpunkt fundierte Theorievorträge, praktische Demonstrationen mit Pferden unterschiedlichster Rassen und Ausbildungsstufen sowie Gastreferenten als Experten mit ausgewählten Vorträgen. Diese ganz besondere Veranstaltung findet nun bereits seit neun Jahren auf Gut Rosenhof statt und wir freuen uns über zahlreiche “Stammkunden”, die den Workshop seit Jahren regelmäßig besuchen. Die Vorträge in englischer Sprache sind auch für Nicht-Muttersprachler gut zu verstehen. Da die Teilnehmer des Workshops zum Teil von sehr weit her anreisen, ist der Mittwoch frei für eigene Unternehmungen. 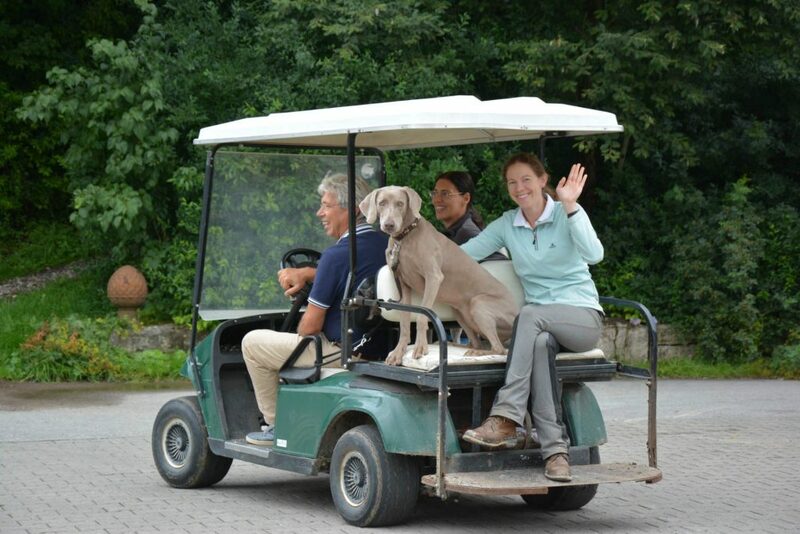 We welcome our participants, visit the animals of Gut Rosenhof and show you round through all stables and the facilities. 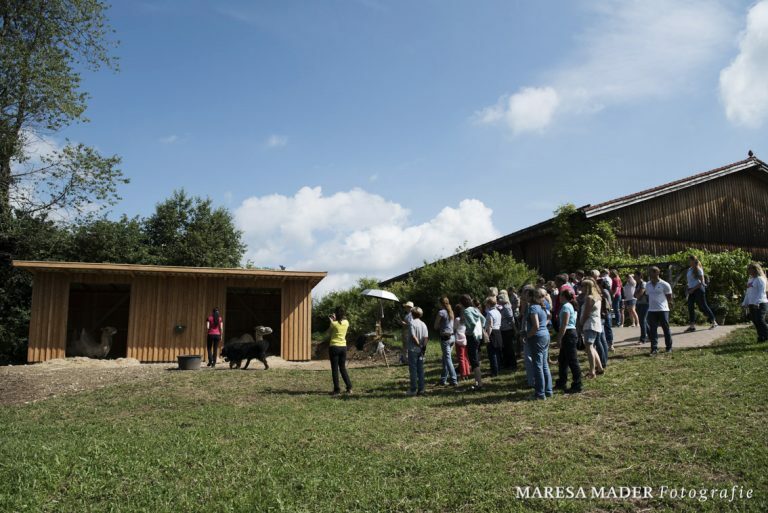 The first day of this year´s workshop belongs to the horse breeds. Therefore we invited journalist and author Martin Haller. 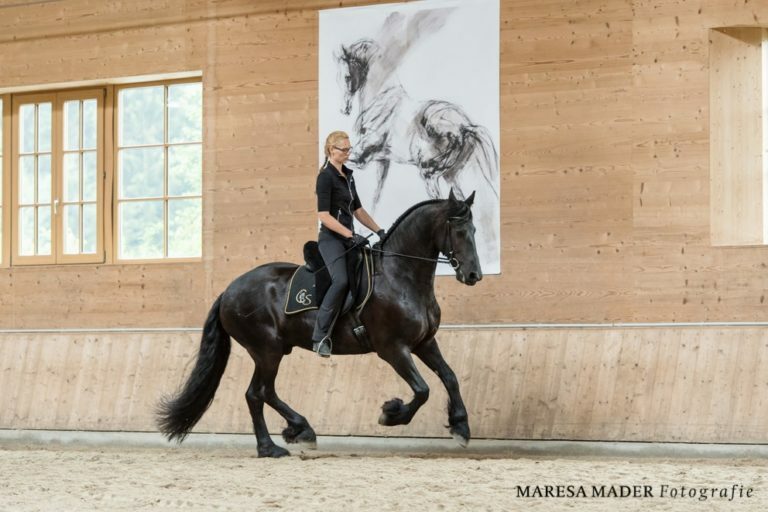 In his German and English publications Martin Haller campaigns dedicatedly for classical dressage and for horse-friendly riding. The experienced horseman had been active in equitation and collected experience in breeding and keeping of different breeds as stud manager in Ireland, among others. 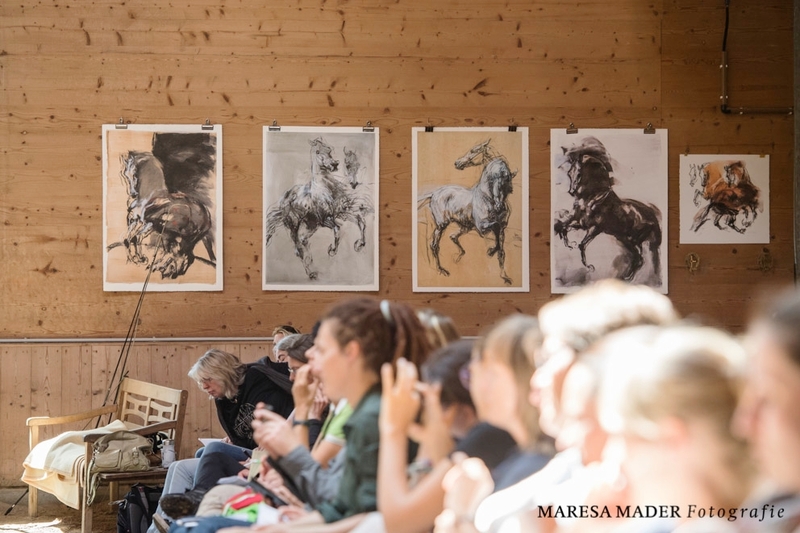 In his lecture Martin Haller gives interesting insights into historical development of the horse breeds at Gut Rosenhof and explains special attributes regarding exterior, interior, breeding and type. Anja Beran and Vera Munderloh present the breed-specific characteristics under the saddle and describe their special experiences with such different horse breeds like Lipizzaner, Kladruber, Lusitano, P.R.E., Frederiksborger, Friesian, Connemara, Arabs, German Warmblood and Akhal-Tekes in detail. 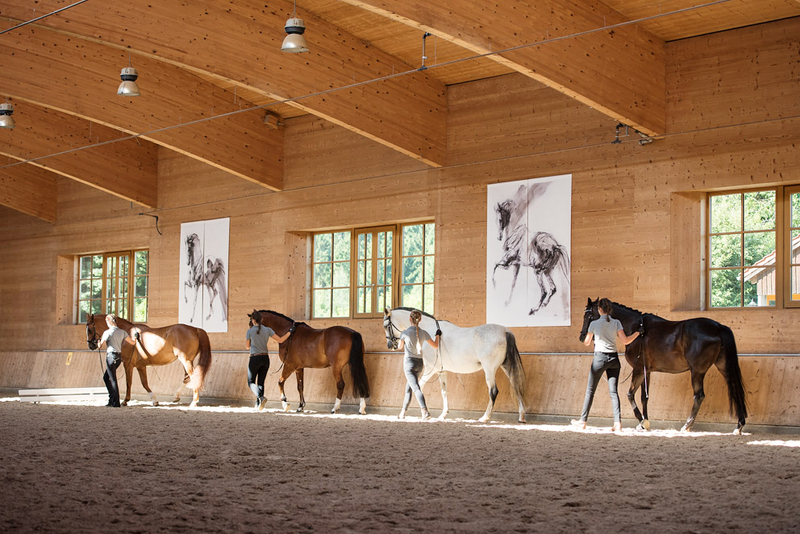 Experience a day dedicated to the diversity of our horses and learn how classical dressage helps EVERY horse based on its individual requirements. A good trainer is characterized by being able to use the strengths of a horse and by working on its weaknesses by the aid of a well thought out gymnasticising. For that matter sound knowledge of the particular breed is very helpful. Because a selection often for centuries and targeted pairing according to specific criteria pass on their individual possibilities and limitations to every horse breed. 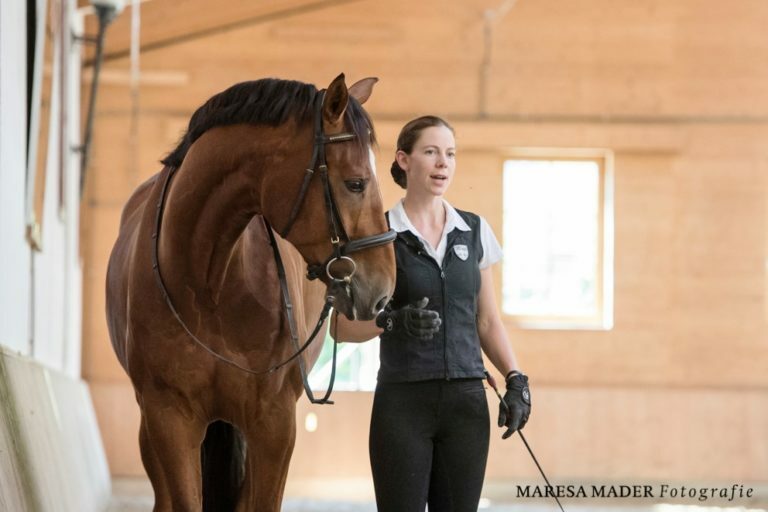 From educating young horses to the completely trained riding horse: a solid communication only is possible if rider and horse has built a common language and worked out particular basics. This would require patience, consequence and much time. Positive motivation has always to be a primary concern of the trainer. Horse-friendly riding aids should be logically, uniformly, unmistakably, precisely and fine. Giving aids at the right time is as important as understandable and logical interaction of the aids. Inconsistent and/or mere mechanical aids miss the point and often lead to assumed contumacies of the horse. So riding aids with much feeling and respect are required. Anja Beran gives an overview in theory and practice which instruments of aids are available for the rider, how the horse learns different aids and how giving fine aids leads to smooth communication with our horse. 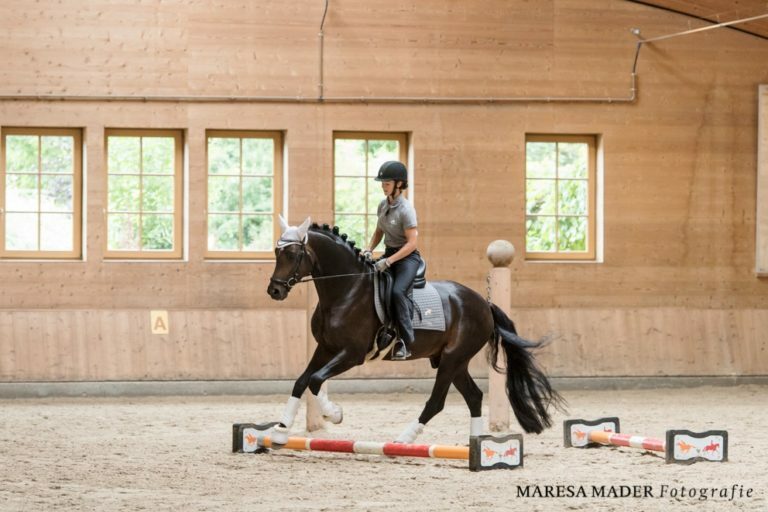 A thoroughly analysis of the riding horse – from the ground as well as under the saddle – is basis for gymnasticising dressage work which purposefully improves, strengthens and ultimately balances our horse. 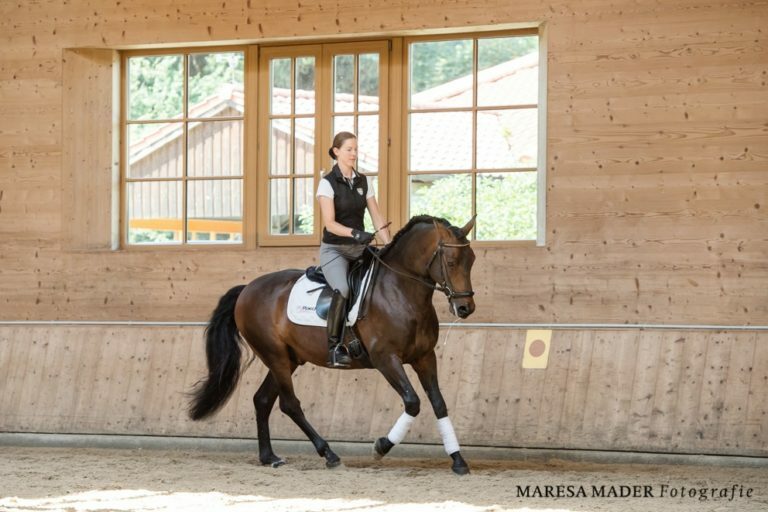 What does straightening mean, how do I recognize natural crookedness of the horse and how do I use the instruments of lateral movements to balance my horse and collect it solidly? Anja Beran settles all these important questions in detail and concretely by means of horses with different challenges. At her training yard Gut Rosenhof with up to 50 horses – among them are many stallions and elder horses – Anja Beran has gained experience for many years and keeps on optimising keeping and feeding of her protégés. She sets special attention on the horse´s digestion. Because complications can cause colics, which can become life-threatening for the horse very fast. In an animation movie guest speaker Georg Rattenhuber comments vividly and comprehensively the processes in the horse´s body while having a colic. Mr. Rattenhuber is an experienced horse veterinarian and for more than ten years owner of the “Tierärztliche Ambulanz Rattenhuber” in Rott (Bavaria). Colics are among the most frequent emergency treatments that Georg Rattenhuber and his team have to take care of. His expertise in this field and a clearly demonstrated animation movie, which shows exactly what happens inside the horse while having a colic, make this lecture interesting for every horse owner to be able to evaluate the risks and signs of a colic better. 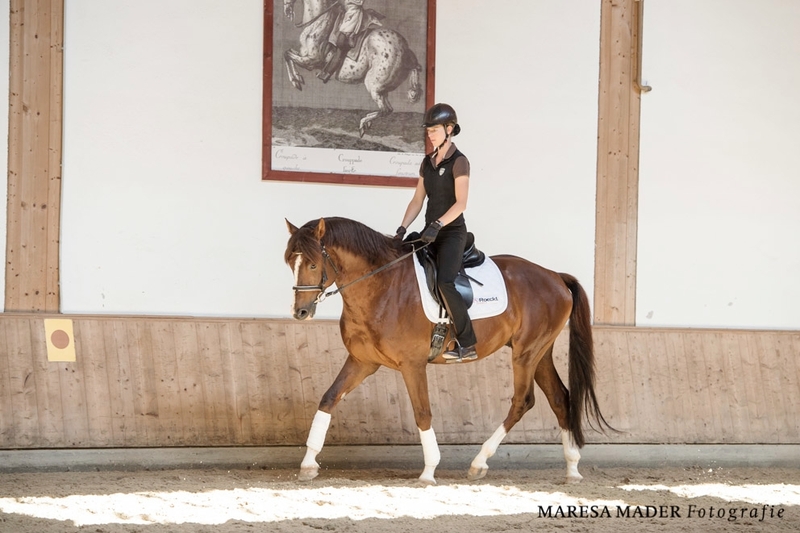 Under the patronage of the Anja Beran Foundation a few warmblood horses are at Gut Rosenhof for training respectively correction for about two years. They are partially from the Main and State Stud Farm in Schwaiganger. 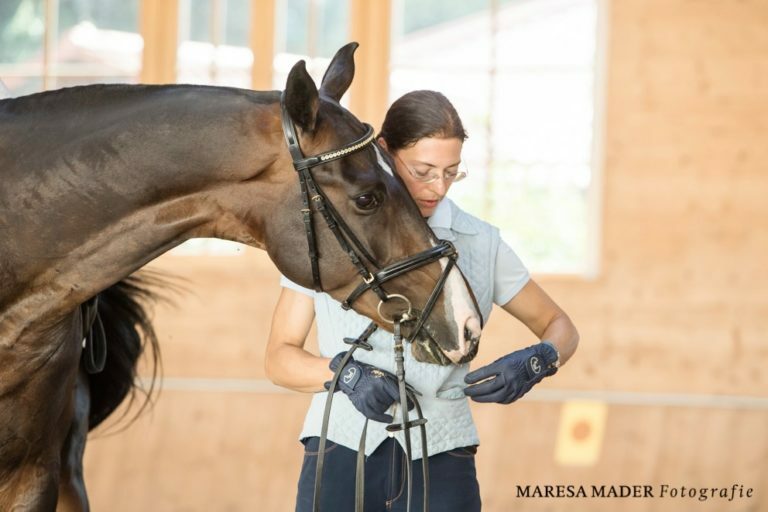 Warmblood breeding creates eagerly moving horses in modern type, with high blood ratio and highly sensitive in handling. However, the system, in which these horses have to prove themselves for breeding and equitation, is extremely wearing for their physical and mental development. Already at the age of two years the young horses have to be put in work, numerous performance tests are opposed to healthy keeping, feeding and training. Not a few horses fall by the wayside in this process, others have to struggle with early signs of wear and excessive demands. 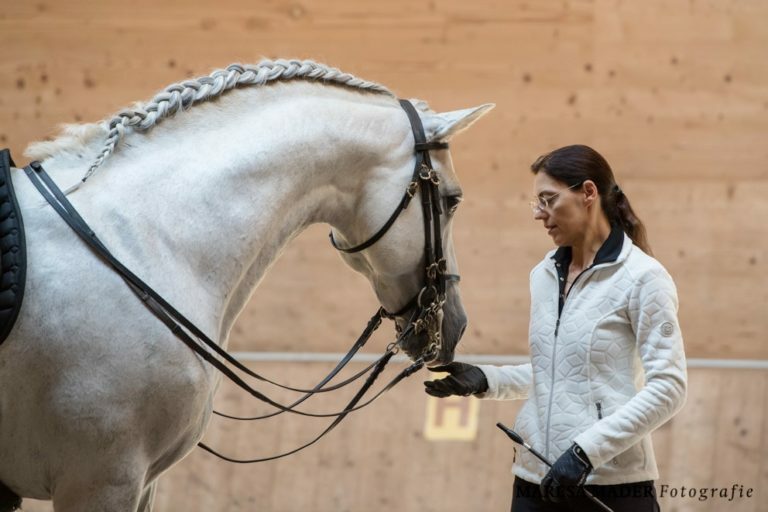 Anja Beran would like to demonstrate at the training and correction of a few of these highly talented horses that horse-friendly dressage according to classical principles provides for a solid education with healthy and happy horses, who work motivated under their rider up to an old age. 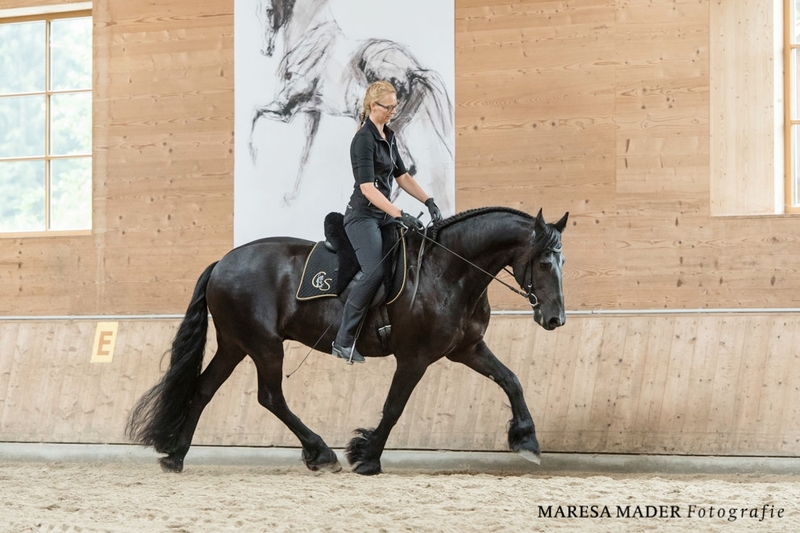 In the course of the workshop you can witness the development of these horses year after year and learn which instruments Anja Beran uses to correct a wrong start with much patience and correct dressage work. Since time immemorial there is a keen dispute over the right position of head and neck. Nowadays cruel training methods like the so-called Rollkur has led to the fact that this aspect is in the focus more and more. 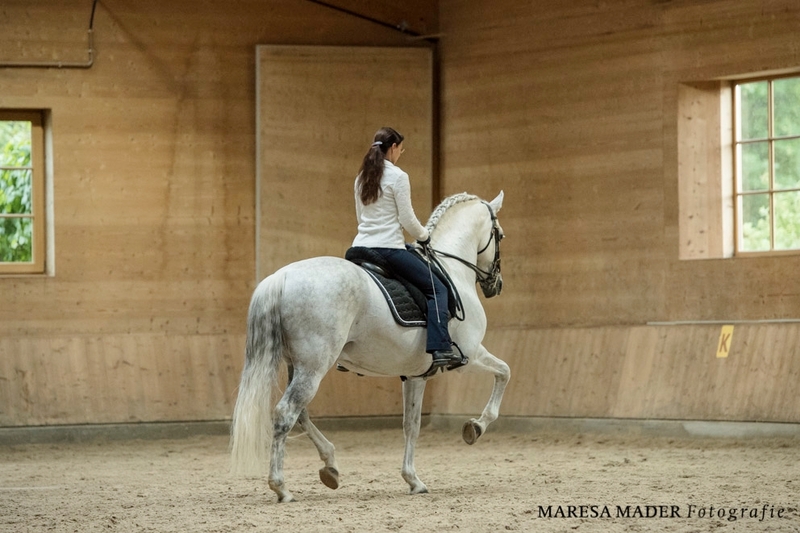 But not only a too dense position, also a head-neck-position which is positioned too high or too low by impact of the rider´s hand is contrary to a healthy course of movement of the horse. Anja Beran mainly criticises in this connection the “hand-emphasized” riding. 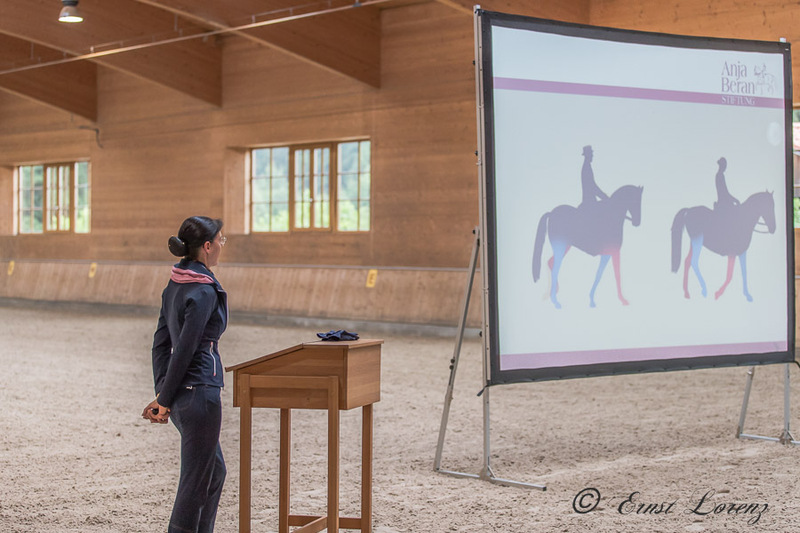 For her a healthy head-neck-position is the result of a correct education and so Anja Beran demands: “Please don´t confuse contact with offering support for your horse – it is necessary that its balance has to be remained intact!” In her lecture Elisabeth Albescu explains concretely and understandingly why a manipulation of the head-neck-position harms the horse´s health and which biomechanical processes are caused by different head-neck-positions. 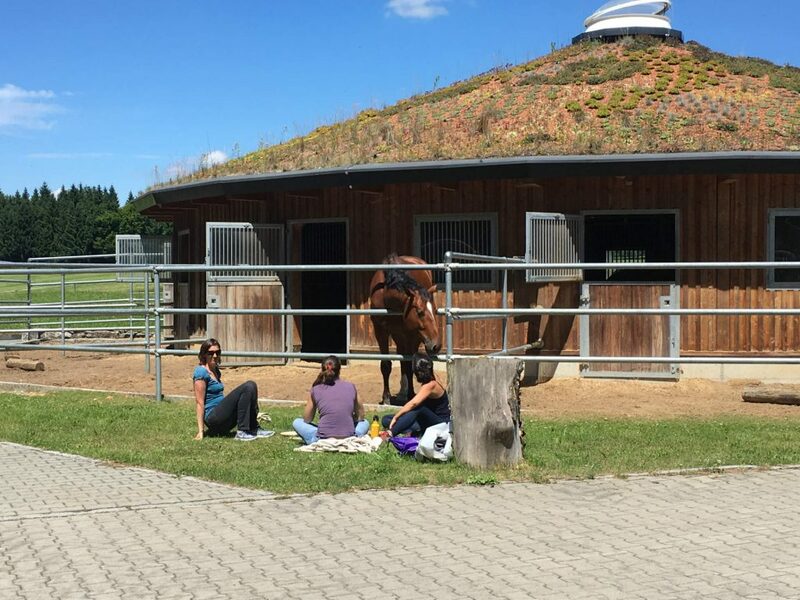 Veterinary specialist in chiropractic (A) Elisabeth Albescu has worked in the field of conventional medicine with horses for many years and specialised in chiropractic and acupuncture eleven years ago. Elisabeth Albescu has already successfully commented lectures of Anja Beran like TRAINING THE EYE from a veterinary medical point of view. Haflinger horses weren´t bred for high school originally. Their strength mainly was in the work input in mountain agriculture. However, for decades the robust blond small horses have enjoyed great popularity mostly with leisure riders. 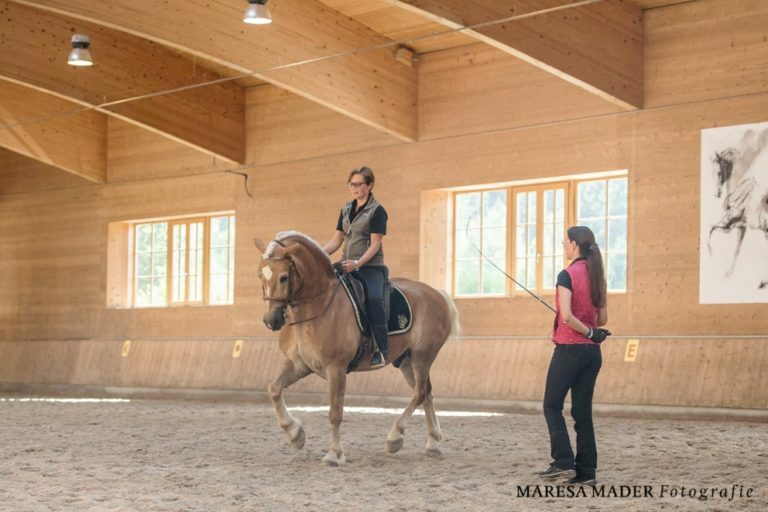 When they train special breeds like Haflinger horses up to high school, Anja Beran and Kathrin Roida impressively demonstrate over and over again that classical dressage is there for ALL horses. 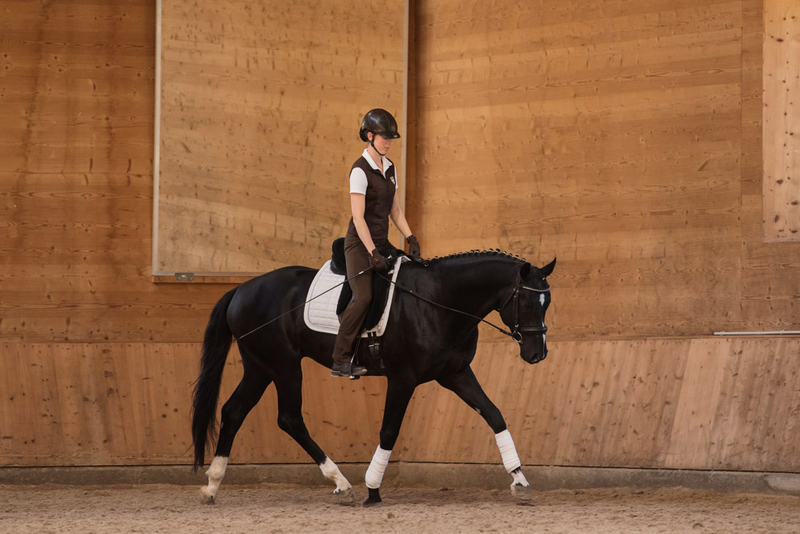 Watch the dressage work with a robust horse and assure yourself of the differences but also the commonalities in training of breeds specially bred for dressage. Kathrin Roida, author of the book “Gymnastizieren an der Hand” works closely with Anja Beran and has made a name for herself in the scope of her versatile horse training especially in the field of in-hand work. Kathrin Roida will deliver comprehensive insight into her work by practical demonstrations from basic education to gymnasticising in-hand exercises. Correct piaffes and passages are the figurehead of a horse-friendly training according to classical principals. 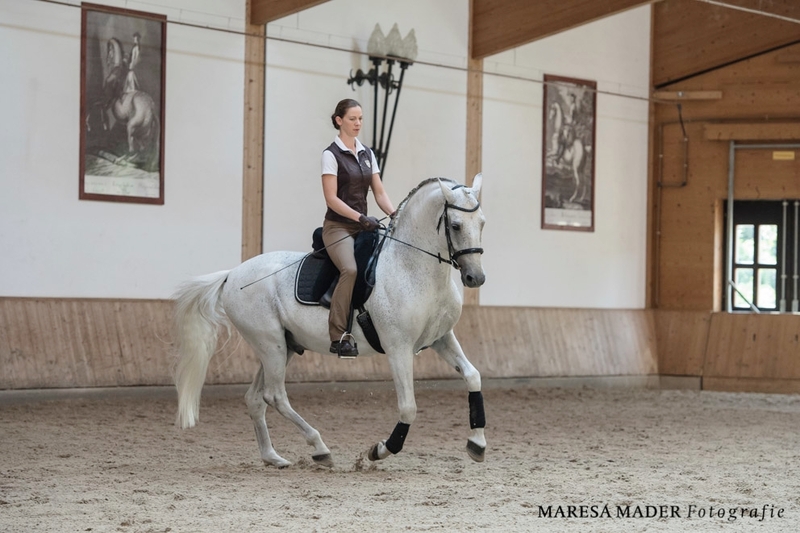 However, for Anja Beran the piaffe is not at all the final aim, but a means to an end to develop lifting force and the related ability for collection of a horse. 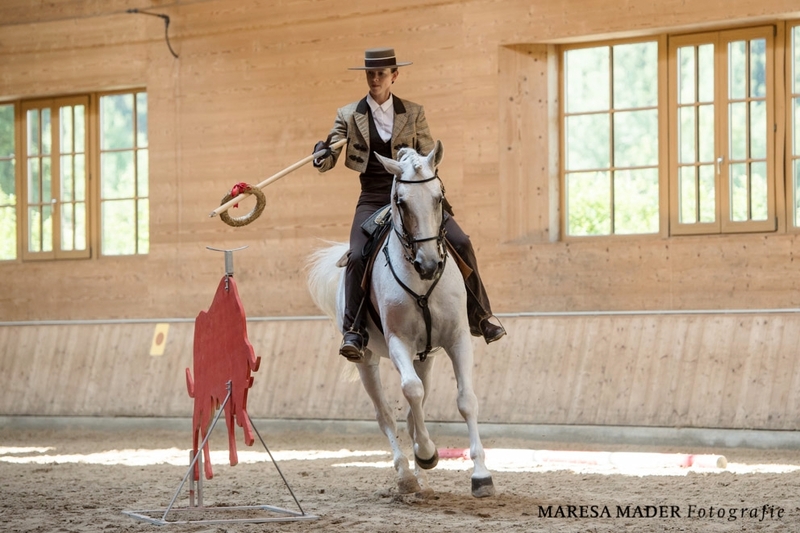 In this process at the end there is no cut and dried lesson – every horse makes the piaffe and passage in its own possibilities. Not the spectacular performance is essential, but the correct one! Anja Beran shows in practice how a correct piaffe and passage should look like, which requirements should be complied with to start with the training and which mistakes could occur. 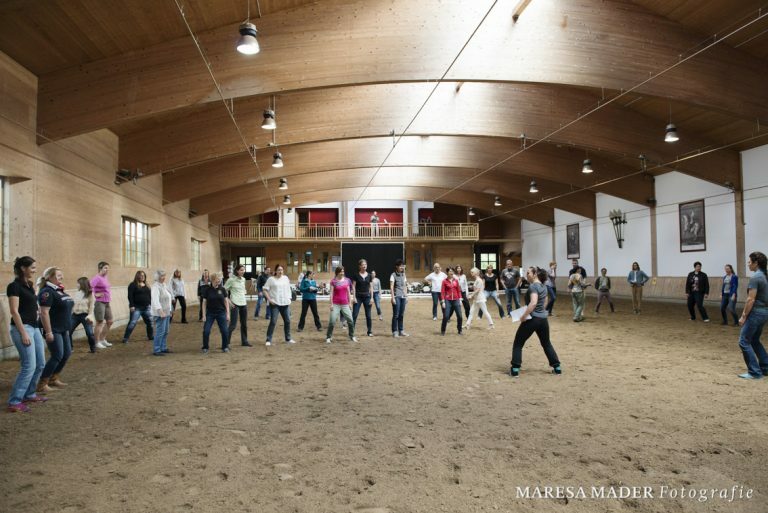 You will experience ways to a correct piaffe and passage by means of different horse types, which sometimes demands different approaches, to reach the same goal: the healthy gymnasticising of our horse. The spanish walk isn´t a mere show lesson for Anja Beran at all, but can have a not to be underestimated gymnasticising value at training a horse. Besides it helps to improve lessons. That´s why the spanish walk is absolutely classic for the trainer – not least also because mainly stallions display this lesson by nature. To carry it out the correct way is very important, which Anja Beran shows in-hand and under the saddle. In addition, different variations of the spanish walk will be presented, like polka, jambettes, spanish trott etc. 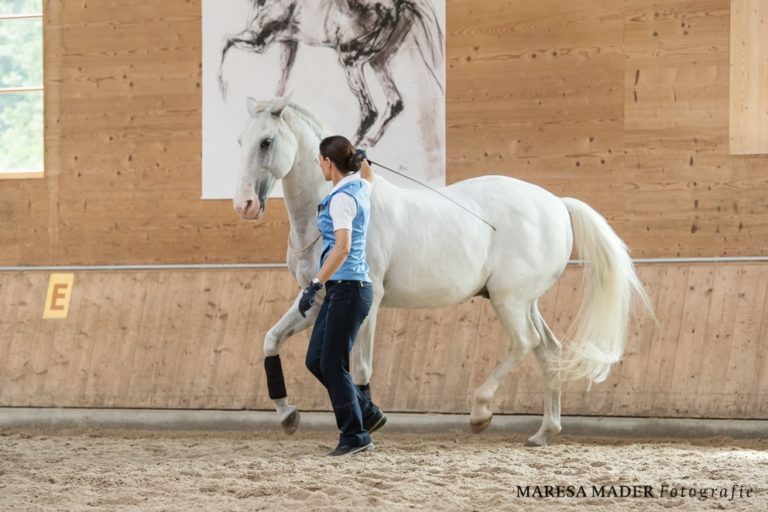 Congenitally the horse is a flight animal – competent handling and diversified work however can strengthen confidence between horse and rider insofar, that also in difficult situations the necessary secureness and control are ensured. 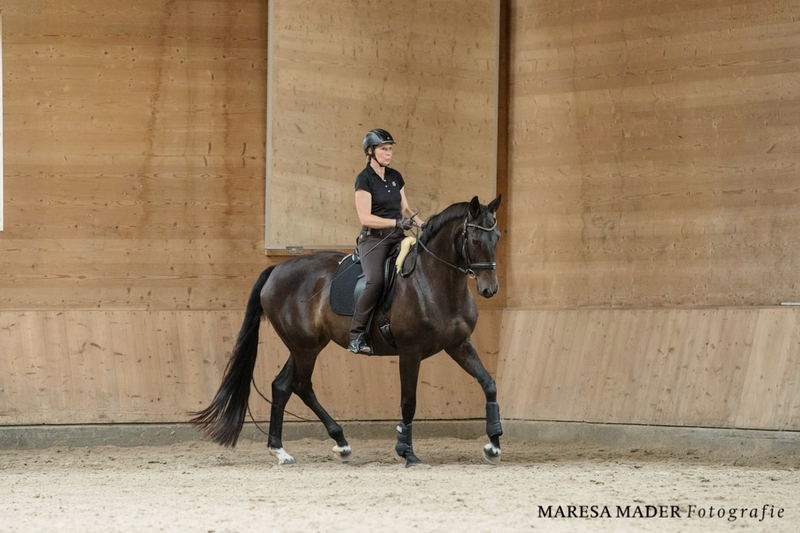 We present exercises to loosen up your daily dressage work and to prepare your horse for unfamiliar surroundings. 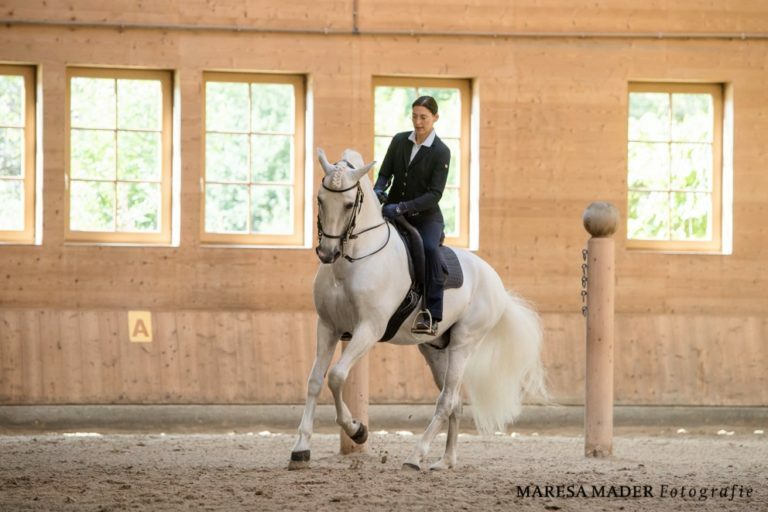 Working equitation is an emerging tournament event, which originally developed from the traditional riding working style in Portugal and increasingly enjoys great popularity. 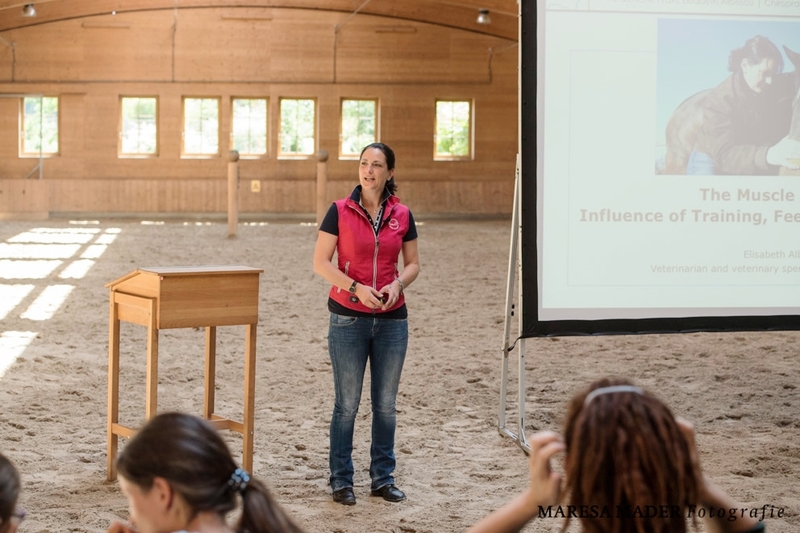 Vera Munderloh delivers insight into the three most important trials of working equitation: dressage, style-trail and speed-trail. 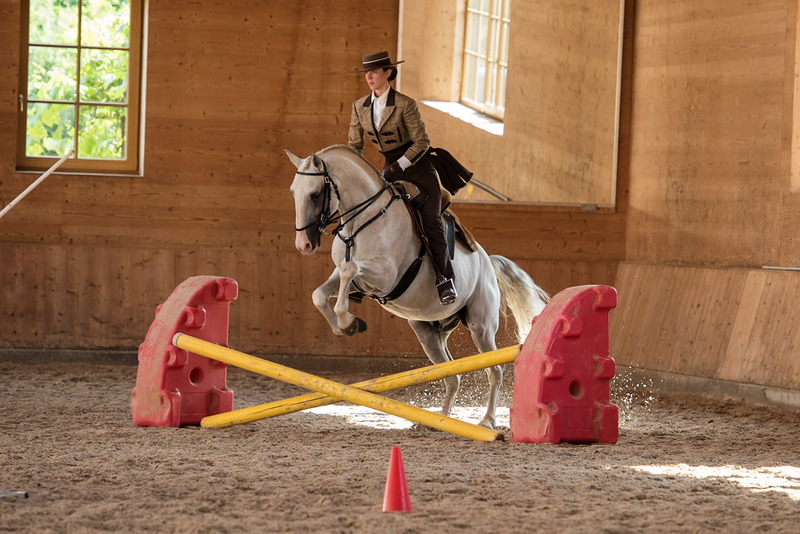 She especially goes into the trail course and shows how to manage its different obstacles with your horse the best way and what your attention should be paid to in training. A practical demonstration in the trail course then shows an impression of a ride well-prepared for tournaments through the obstacles. How does canter work look with remonte, how does it look with the advanced horse and which collected lessons in canter are the aims of high school? Here also the most important requirements and the most frequent mistakes will be addressed to. 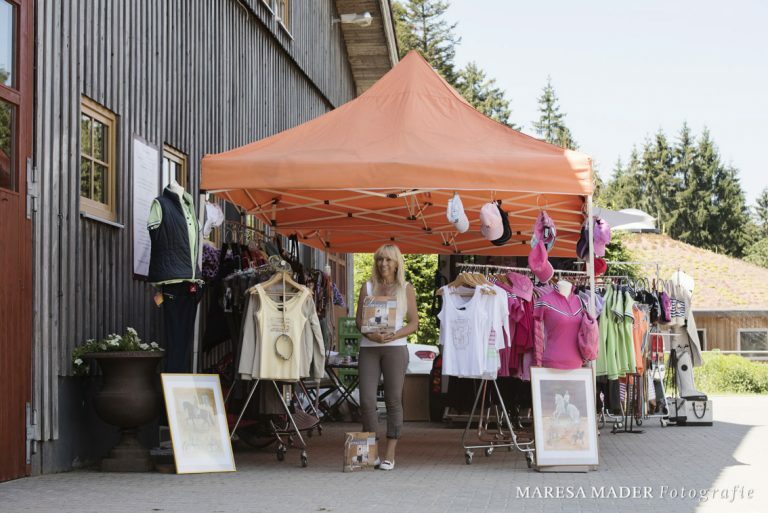 Circus lessons are absolutely taken serious in Anja Beran´s training with horses, also if they are supposed to motivate the horse and guarantee some variety primarily. Which lessons are especially suitable for which horse type, how to practice them and with which benefits circus lessons are connected for dressage in general, this is what our final issue in theory and practice is about. It is of interest to riders of all levels (both professionals and hobby level) when the horses well-being is in mind. To riders of horses at all ages and all training levels. All kind of horse breeds, rehab horses and problem horses. 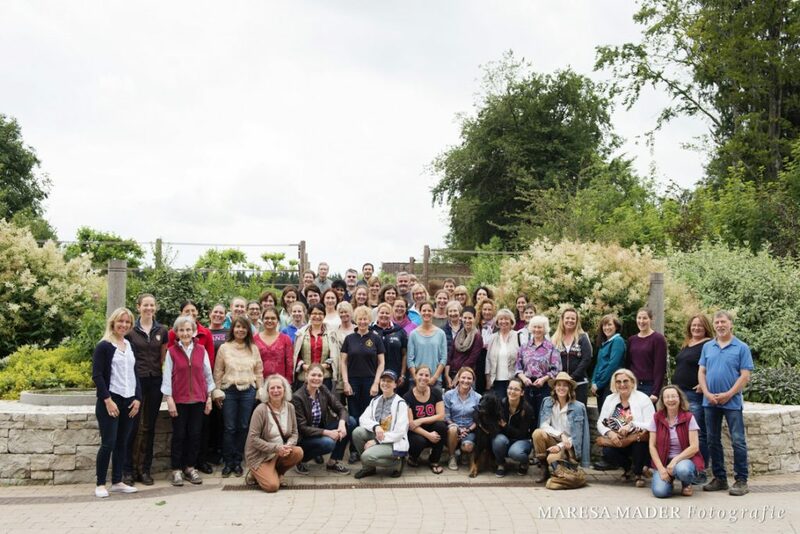 Meanwhile guests from nearly 20 different countries have attended this exclusive and established workshop at our idyllic training facility Gut Rosenhof. Gut Rosenhof is the home of about 45 horses, and all kind of other animals like camels, goats, dogs, cats, pigs, poultry, pigeons, ducks, geese, deers. It is a place which conveys harmony, relaxation and peace to people working and learning here. Gut Rosenhof is situated in the beautiful Pre Alps about 70 minutes by car southwest from Munich, Germany. It is also possible to attend the workshop for single days only. 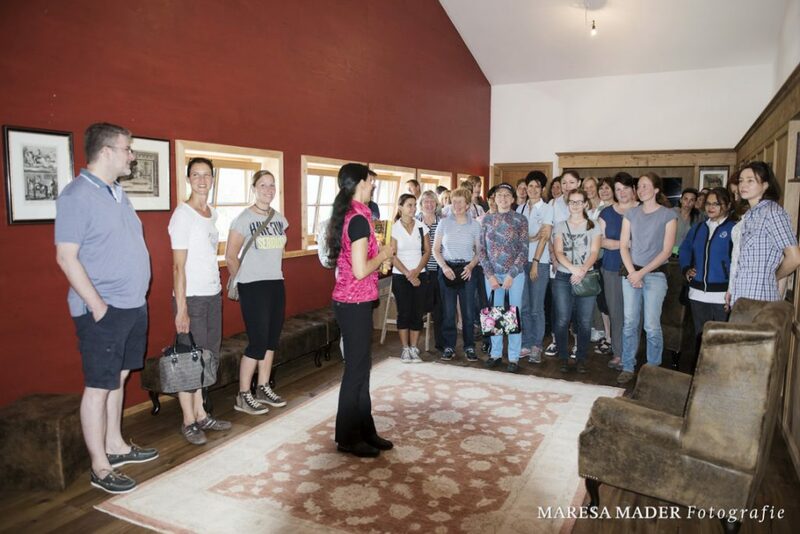 We would be very glad to welcome you at Gut Rosenhof! An impression from our International workshop “Get the spirit” from the year 2015: „Descente de main“ in the piaffe. Teilnehmerstimmen zeigen, wie lehrreich und gleichermaßen unterhaltsam und erholsam diese Woche im Kreis von gleichgesinnten Pferdefreunden aus aller Welt ist. This was the second/third time we participated in the ”Get the spirit”-Workshop and we are impressed by the variation in content over the years, and in the program this year. We enjoyed all the practical examples very much, and feel that we have learned a lot from them. It was very interesting to see and explore differences between breeds, ages and types of horses and how this affects the training. 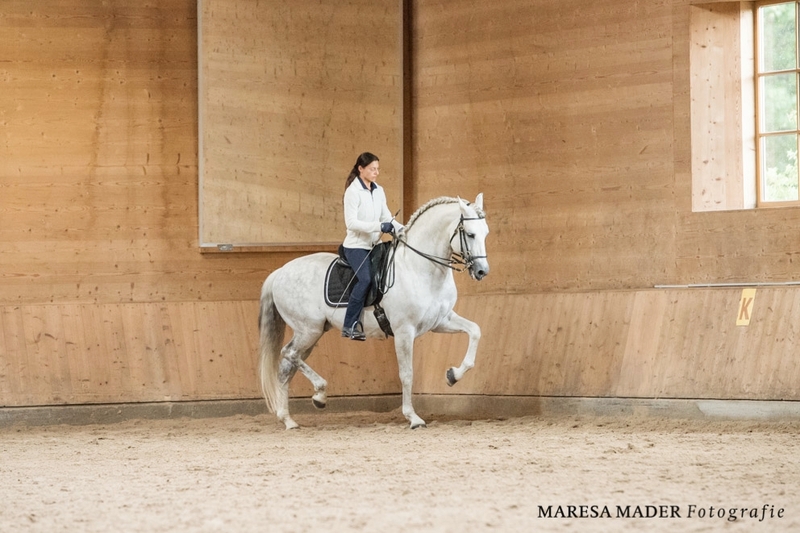 For us, riding warmbloods, it was particularly interesting to see the similarities and differences between the work with that breed and the work with Iberian horses. We find this workshop extremely useful and inspiring and plan to return over the coming years! I am coming back every year since its inception in 2011 because there is always so much to learn that I can take home to my horses. I am using what I learn from these workshops instead of taking lessons and it has brought us much further than any instructor in my area would ever be able to. The images of beautiful riding and balance stay with me and improve my riding as I am aiming at achieving something similar. Thank you for another great Workshop. Once again I came home equipped with knowledge and tools to help me continue the journey with my horse and in the constant pursuit of improving my own riding and training abilities. It was a most inspiring and helpful clinic and Gut Rosenhof is just beautiful. To be surrounded by like-minded classical dressage enthusiasts was a lovely experience and I valued every moment. All of the demonstrations and lectures were very informative and have certainly given me lots of homework! We definitely “Got the spirit” and the inspiration from the Workshop! Loved every minute of it. Learned a lot. It is always a joy to come together with people who share a vision, and listening to everything you tell/explain and show is so inspiring. This is a truly outstanding view into how dressage is for the horse and not the horse is for dressage! 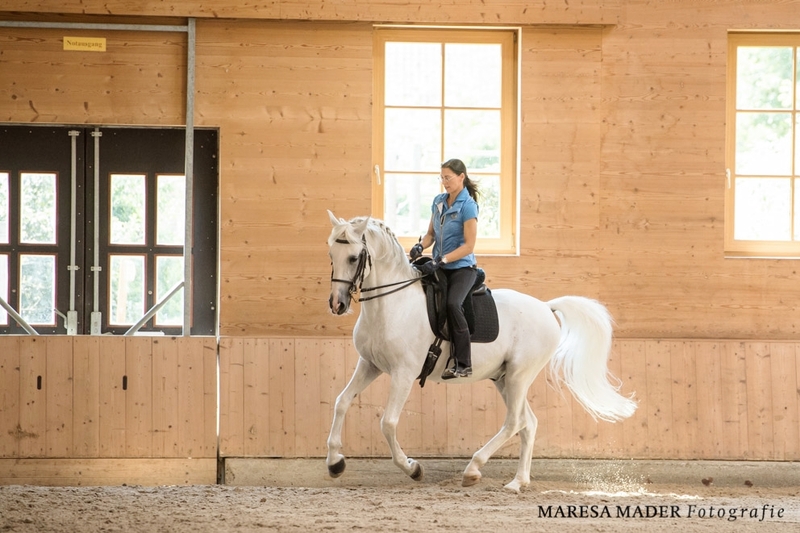 Truly beautiful and an inspiration in my daily work at home with my horses – thank you! We will be back annually. It is wonderful to see how the riders and horses progress year by year, particularly the young ones we have seen from the start like the Malakil, Safi and Nadal. It is difficult to imagine where any student could go to learn more, to find such variety of horses to ride, the stimulation of new disciplines to try, and such exemplary classical trainers than at Gut Rosenhof. For me as a riding instructor, participating in this workshop is always like a little vacation. The atmosphere is great and you can watch only good, harmonious riding the whole week – a recovery for all senses. At the same time, the event is a great source of inspiration for my own work. There is a lot to see and to learn everytime, that’s why the workshop is an absolute highlight for me every year.